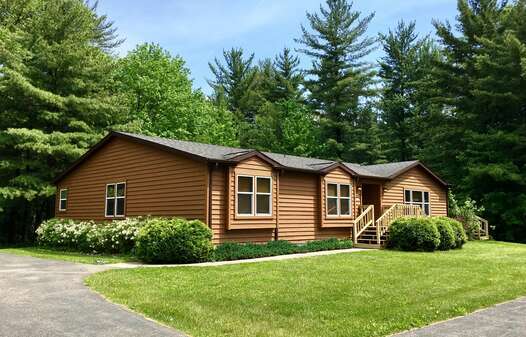 After a day of splish splash entertainment in the Midwest’s top vacation destination, come home to this cozy four bedroom, two bath ranch style abode. With quick access to Wisconsin Dells’ attractions and water parks, this roomy home is the perfect place to set up for the weekend with friends and family. The outdoor area is readily equipped with table and chairs, a charcoal grill and a fire pit for evening bonfires. The Trails End sleeps a maximum of 10 people. Four individual bedrooms provide privacy and space for you and your guests. The master bedroom has a king bed, TV, and a private bath with whirlpool tub. The three additional bedrooms come with a king bed in each, TVs and share the second full bathroom. Enjoy that morning coffee in a nicely equipped kitchen complete with a separate dining area, seating at the breakfast bar and full appliances - including a dishwasher. The kitchen is open to the living room which has a gas fireplace, TV and sitting area. The common area sofa sleeper (queen size) offers nighttime accommodations for additional guests. Finish the evening amongst friends with a game of billiards in the adjacent game room. Read your book on the deck, catch the spectacular view of the bubbling waterfall outside or browse the internet using the complimentary WIFI provided. A large utility room with washer and dryer add to the conveniences afforded to guests of this home. The Trails End is located across the street from an outdoor pool and is a short drive to Spring Brook’s main clubhouse complex which is home to the Spring Brook Sports Bar & Grill, indoor/outdoor pools, fitness room, golf course and pro shop. Home sleeps maximum of 10, rates based on 8 people over the age of 3. Extra guest fee of $15/night per additional guest applies. Memorial Day and New Years Eve Holidays require $250 Security Deposit.